King George Medical University has been ranked among the top 5 medical colleges in India 2016 by Outlook India. It has been ranked #5 by Careers360’s Top Medical Colleges in India 2016. Prof.(Dr.) Ravi Kant (born 14 September 1956) is a Professor of Surgery and Padma Shri award winner. He is director of All India Institute of Medical Sciences, Rishikesh. He was Vice Chancellor of King George’s Medical University, Lucknow from 2014 to 2017, he was also head of surgery at All India Institute of Medical Sciences(AIIMS), Bhopal. Earlier he was faculty at Maulana Azad Medical College, New Delhi. Autar Singh Paintal M.D. Ph.D. was a medical scientist who made pioneering discoveries in the area of neurosciences and respiratory sciences. He was a merit student and did his post graduation in Physiology from King George Medical College, Lucknow. of >20 years in the area of international agriculture. Anil Kohli is an Indian dental surgeon, medical administrator and a former president of the Dental Council of India. He is an elected fellow of the Faculty of Dental Surgery of the Royal College of Surgeons of England and holds the honorary rank of ‘Brigadier’ in the Army Dental Corps. He is a recipient of B. C. Roy Award, the highest Indian award in the medical category. The Government of India awarded him the fourth highest civilian honor of the Padma Shri in 1992 and followed it up with the third highest civilian honour of the Padma Bhushan, in 2005, for his contributions to medicine, making him the first dentist to receive both the honors. Dr. Ravindra Nanda is a professor and Head of the Department of Craniofacial Sciences and Chair of the Division of Orthodontics at the University of Connecticut School of Dental Medicine. He is part of the founding faculty of School of Dental Medicine and has been at the University of Connecticut since 1972 where he also holds an Alumni Chair in the Orthodontics Division. He is an innovator of various appliances in orthodontics. His research and clinical interests include adolescent and adult orthodontics, the biology of tooth mobility, craniofacial orthopedics, biomechanics and developing efficient mechanics to deliver orthodontic care. The number of beds provided was 232 and besides the main Hospital block there were an Isolation Block and separated Cottage wards. The formal opening of King George’s Hospital with the opening of the New Bridge over the river Gomti River opposite the Hospital was performed in January 1914 by His Excellency the Viceroy Lord Hardinge; the Bridge took the place of an ancient bridge built by King Asaf-ud-Daulah in 1780 and which was only demolished as late as 1911-12. Since 1922, the College and Hospital has expanded in several directions. A comprehensive museum of microscopic and macroscopic. Pathology has been created, an X-Ray and Electro-therapeutic Section for Hospital out-patients were opened in 1928. A new building housing the Pharmacological departmental with its laboratories and museum and containing a fine clinical theatre was completed in 1927 at a cost of Rs. 55,000/= ‘ It 1926, a Provincial Pathology scheme was introduced where by the College Pathology Department was linked up with the various Civil Hospitals throughout the Provinces which were thus enabled to obtain certain diagnostic tests, if they so desired. The Queen Mary’s Hospital for women and children was opened in 1932 when the Govt. completed the building of this Hospital at a cost of Rs. 2, 67,603 and handed over to the University. The building for a separate T.B. 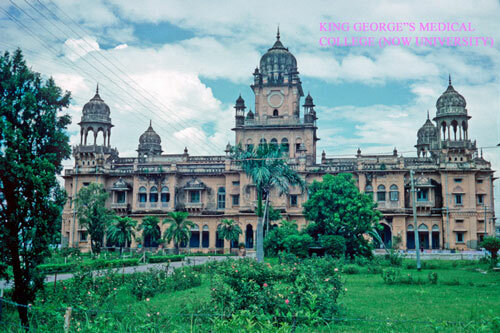 Hospital was completed and handed over to the King George’s Hospital on March 15, 1935, which finally got converted into the Tuberculosis Department in 1946. In the immediate post Independence phase the Departments of Orthopaedic Surgery and (ENT) Oto-Rhino Laryangology were established in 1951 and the first M.D. degree in Forensic Medicine in India was awarded. A separate building of Medical Ward with the bed strength of 144 was started in 1952. In 1955 Pathology got a new building. A separate building of the Children Hospital was completed in 1956, the independent Department of Paediatrics started in 1960 and MD Paediatrics in 1962. In 1961, Social and Preventive Medicine Department was born. Departments of Psychiatry, Neurology and Cardiology are the gifts of the seventies. A unit of Plastic Surgery was created in 1962 and by 1966 the Department of Plastic Surgery had started it’s residency program – one of the first in India to do so. Micro-biology, Biochemistry, Physical Medicine and Rehabilitation and Hospital Administration are the gifts of the 80′ s and Neuro-Surgery and the Institute of Clinical Epidemology are the gifts of 90’s. Several budding specialities like Neonatology unit, Paediatric intensive care unit, Oncology, Endocrinology, Nephrology, Urology, Thorsic Surgery, provided highly specialised care to patients in Hospital. Finally following departments were carved out of the Department of Surgery at the fag end on nineteenth century.